Single point cutting tools are commonly used in lathe,palners,shapers machine for cutting operation. These tools are classified as left handed and right handed. A tool is said to be right handed if their cutting egde is on right side when tool is viewed from the point end. Terminology or Nomenclature of Single Point Cutting tool. This specification is according to American Standards Association (ASN) Systems. It measures downward slope of the cutting tool from the nose to the rear along the longitudinal axis. It guides direction of chip flow and protects cutting tool point. Softer the material, greater should be the positive rake angle. 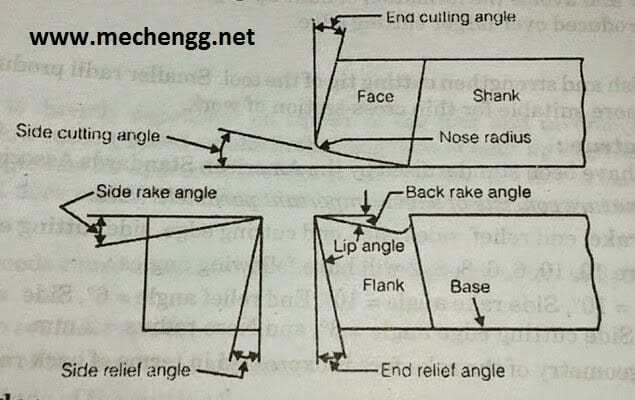 Back rake angle may be postive negative or neutral. It measures slope of the top surface of the tool to the side in direction perpendicular to the longitudinal axis. The angle also guides directions of chip away from the job. The amount by which a chip is bent depends upon this angle. When side rack angle increases,magnitude of chip bending decreases. Smoother surface furnish is produced by larger side rake angle. This angle is between flank of the tool and a plane normal to the base just under the side cutting edge. This angle allows the tool to fed sideways into the job in order to cut the work material without rubbing. When side relief ange is very small,the tool will rub against the job and therefore it will get overheated and become blunt and the surface finish obtained will be poor. This is the angle between side cutting edge and longitudinal axis of the tool. It controls the direction of chips flow and avoid the formation of build up edge. This angle also distributes the cutting forces and heat produced over larger cutting edge. It increase finish and strengthen cutting tip of the tool. Smaller radii produce smoother surface finish, Small radii is more suitable for thin cross section of works.